Thank you so much for all of the lovely comments that I received when I shared Miss C's nursery space. Missed that post? You can read it right here. For those that contacted me with questions, I do hope that this post covers everything that you wanted to know. If not, please comment below and I'll try and address your question too. 1. I cannot see any toys in your nursery. Where do you keep these? Can you share how these are organised? At the moment the kids do have a selection of soft toys in a hamper inside the wardrobe. 2. Where is your cot from? The cot is a 'hand me down' from Mr B's nursery. In fact it is now in Mr T's nursery, so is definitely well loved! 3. 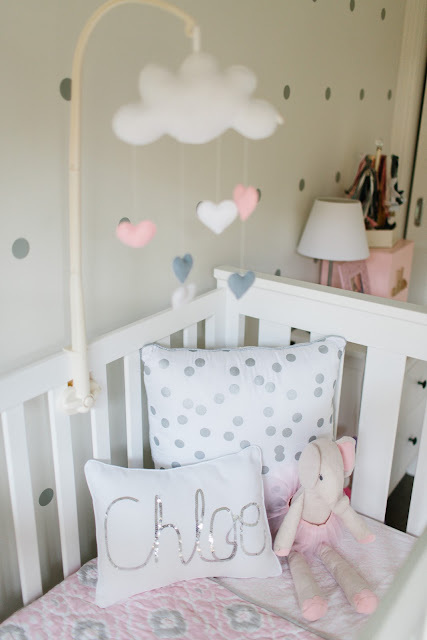 Where is the cot linen from? 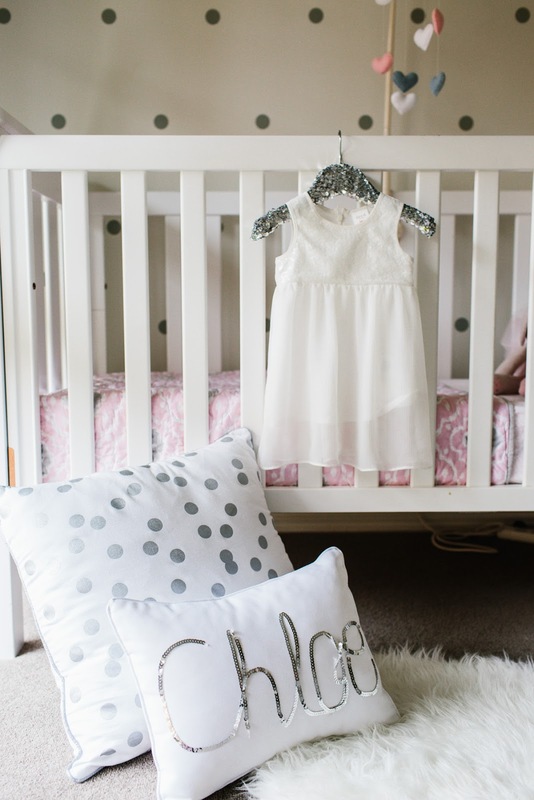 The cot linen was purchased from Pottery Barn Kids and is the Claire Nursery Bedding range. At the time of purchasing it wasn't available in Australia (but it is now), so I had it shipped from the US. 4. Where is the Cot Mobile from? 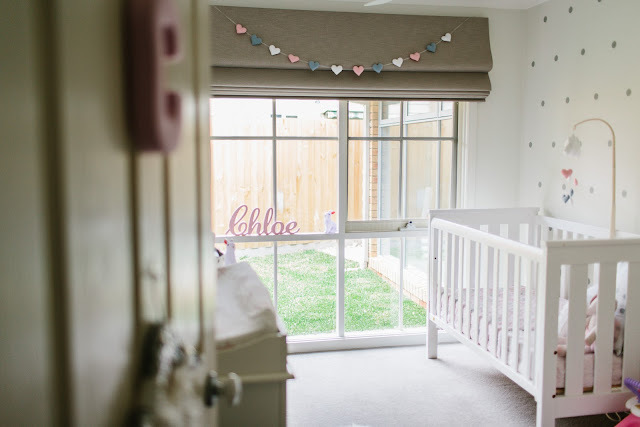 The cot mobile (and the bunting that hangs above the window) were made by Maisie-Moo Felt Creations who are based over in New Zealand. If you are a local Australian based business that makes something similar, please feel free to comment below and share your business details. 5. I adore your mirror!! Where do I get one? I searched high and low for the perfect mirror for this space but could not find anything I loved. In the end I purchased this Ung Drill Mirror from Ikea. The mirror retails for $69 but unfortunately it only comes in black. 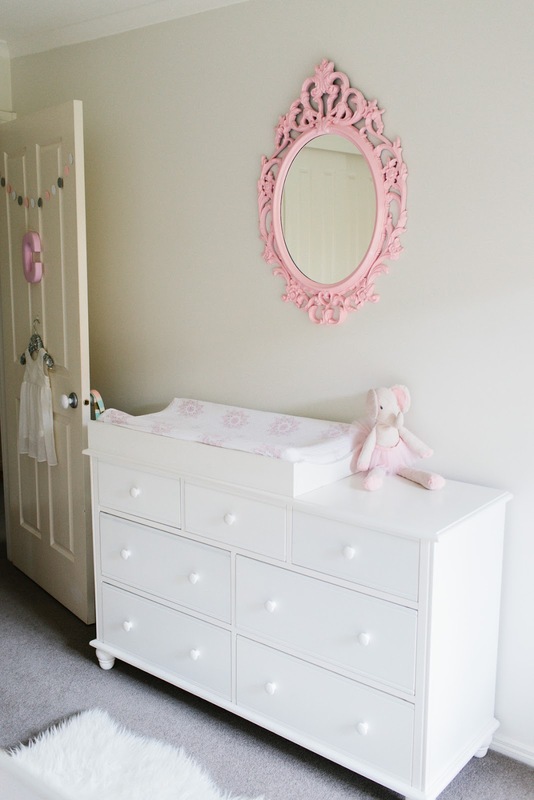 To create the perfect pink colour, I used Rustoleum 2 X Ultra Spray (in Candy Pink colour) to spray the mirror. I also used the same spray paint (it is brilliant!) to do her wooden name that you can see in the room. Sadly I think that this colour is discontinued, but I hear whispers that it may be returning to shelves soon - I hope so! The mirror is one of my favourite things in the room and it has remained when I updated this space to a 'big girl' room recently. Yes I will share this space with you too!! 6. Where are the change table/drawers from? This is yet another 'hand me down' from Mr B's nursery space - now residing in Mr T's nursery. I purchased it (super cheap) on Ebay way back four years ago now. Despite the low price tag, the quality has been great and I adore all of the drawers for storage! 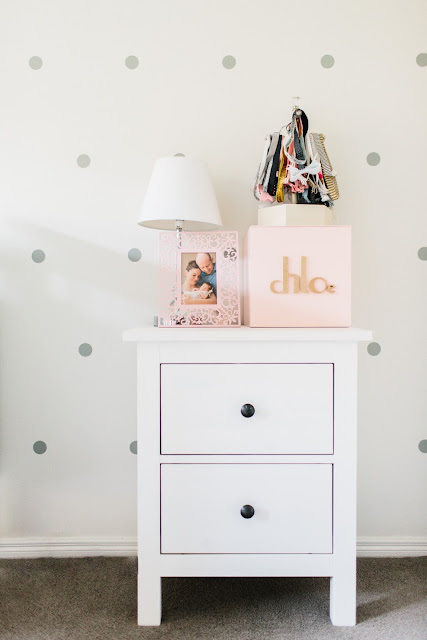 If you don't have a huge amount of space in your nursery, I definitely recommend looking for a drawer/change table combo like this. The change table part can easily be removed for you to keep using the drawers down the track too. 7. Where is the bedside table from? Again another Ikea purchase! This is the Hemnes Chest of 2 Drawers that retails for $169 (though I picked up on a promo for $89 or thereabouts). Sadly this didn't make the cut in the new 'big girls room' so is collecting dust now in my garage! 8. What is that you are using to organise headbands? That little contraption pictured above is actually a jewellery organiser from Pottery Barn Kids. I ordered it at the same time as the linen from the USA. I have searched high and low on both the Australian and the US site but can sadly no longer see this product in stock. 9. Where is your wall canvas from? This was an Adairs Kids bargain - I think I paid $10 for it!! Adairs used to have the most amazing range of canvas prints super cheap, but I haven't seen any in stores or online for a long time. For some cute wall canvas prints, try the Reject Shop. 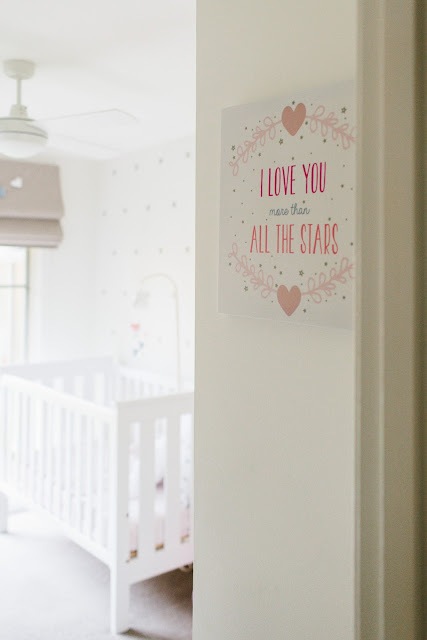 Or to get some gorgeous prints done for the wall (to be framed) try Mint Imprint who I have just purchased some prints from for Mr T's nursery. 10. Where is that sequin hanger from? Is it baby sized? The divine sequin hanger is by Each Day with Jay. It is baby sized but also comes in an adult size too. Silver not your thing? Then it is also available in gold, black and pink and are a steal at only $8 each!! I have one of these to give away, so be sure to stay tuned for that! As you can see, I have popped mine on the door to display Miss C's pretty outfits. This was her Christening dress that was hung up at the time, but I now use it for her tutu dresses from Cotton On Kids (which she has way too many of!). Ahh yes, the sequin cushion... if I had $1 for every email/message/comment asking where this fabulous little cushion came from then I would be rich!! This cushion is by the amazing Tamsyn from Max & Me Homewears. It is by far my favourite piece in the room and still takes pride of place on Miss C's big girls bed in the recent room transformation. if you haven't checked out Tamsyn's goodies, definitely do as she is one super clever lady! Oh and did I mention that I have one of these cushions to give away too?!! If I have missed something, please feel free to comment below or contact me. Miss C's Nursery is in Little One Mag! !